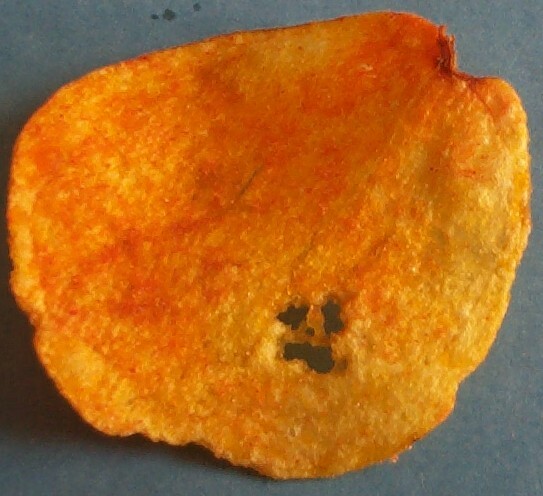 To my horror I found this evil barbecue Demon-Faced Chip O'Lantern in a bag of Wachusett Barbecue potato chips. Fearing for my life and filled with fear, I decided to put the chip on Ebay in hopes of someone buying it for huge amounts of cash so I could retire. Alas, it was not meant to be. After a week on Ebay and lots of viewers, it did not receive a starting bid of $.99. It later met with doom as my wife decided to send it to the great chip factory in the sky. She squashed it. Here's a closeup of its scary face of doom. Don't look at it for too long as a trance of unbreakable fear may result.